I had a dream last night… for which I sincerely apologize now. General Settings - settings which we want to apply to ALL Snom devices in our environment, for example, Language, Time Zone, Date Format, Time Format, VLAN’s, QoS tagging and so on. Phone Specific Settings – settings to be applied to each individual phone. I do not intend to elaborate on this too much since you don’t want to use it in your OCS/Wave14 environment – I will explain later. Firmware settings – information about the firmware version that MUST be installed on the unit. Let’s put all his together. Upon boot, snom300 will submit “Vendor Class Identifier” via DHCP Option 60 (“snom300” in this case). 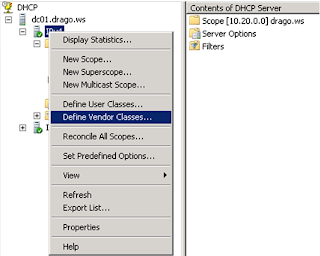 In this post, we configured our DHCP server to respond with “Predefined Options” (that is, Options we want to supply to any device that reports THIS particular “Vendor Class”. The reason is – we might have configured DHCP to respond with “Provisioning URL = http://provisioning.drago.ws “ to all snom300 phones, but “Provisioning URL = fox.drago. ws” to all snom370, snom820 and snom870. We have just told the unit to look for file named “general.xml” at this URL – https://provisioning.drago.ws. First – note that I want any further exchange between the phone and the webserver to be encrypted and second, told the phone what is the URL. This is because I could redirect the phone to a different URL if I had reason to do so. <settings_refresh_timer perm="RW">3600</settings_refresh_timer> - 3600 is the number in seconds the phone should request, obtain and apply this file again, in case we want to push any change of settings. <ntp_refresh_timer perm="RW">86400</ntp_refresh_timer> - 86400 is the number in seconds before the next time sync. <retry_after_failed_register perm="RW">60</retry_after_failed_register> - interesting parameter that forces the phone to reboot itself when registration fails for number of seconds - 60 in this case. <codec_tos perm="">184</codec_tos> - Here we instruct the phone to tag the RTP traffic with DSCP Option 46 (Expedited Forwarding) QoS Type Of Service. <signaling_tos perm="">184</signaling_tos> - same as the above, but tagging SIP (signaling) traffic. The last three lines require special attention. <firmware_interval perm="RW">480</firmware_interval> - Hre we tell the phone to check every (480 in this case) minutes if new firmware is available. <firmware_status perm="RW">https://provisioning.drago.ws/firmware.xml</firmware_status> - ...and finally, where the phone should check for the most current firmware the admin wants to apply. Here we just told that the phone MUST have version “snom300-OCS-8.5.3-SIP-f.bin” currently installed. At this point, the phone will compare the current FW version to the one in the “firmware.xml” and now we have two possibilities – the firmware on the phone is the same (the counter is reset and new cycle of 480 minutes begins), or the firmware does not mach. If the phone is not on call or off-hook, it will reboot, download the new firmware, apply it, read the general.xml and firmware.xml and register if provisioned with a valid account. I placed the .bin file in separate folder - “300”, in order to keep some consistency i.e. firmware for model 300 is located in folder “300”, the one for model 870 in folder… “870” and so on. Next week we will discuss where the parameters like "date_us_format" - come from and how we can add additional parameters to our provisioning files to get the most of the manageability story of Snom VoIP phones. Managing any VoIP endpoint could be a nightmare or a pleasure, depend of how you view it. Pretty much as Group Policy – you might not use it at all and the environment will still work, although every time a change must be made, one needs to touch every device. Or… make a single change on central location and have it applied at once. Snom endpoints are no exception. Being a multi-platform, multi-protocol device, it often confuses the administrator/enduser with the rich set of features and… the end result could be either mismanagement (lack of management, that is) or over complication. Based on my experience, I intend to make series of posts describing some of the methods and procedures necessary to have one healthy Snom environment. Snom phones rely on provisioning server, essentially an http or https server that responds to a particular request with specific xml file(s), which are later applied to all phones or a particular one, thus managing settings, user account and so on. Before we go in to details about the format and the content of the provisioning files, we must answer perhaps the most important question – how Snom phone will “know” where to go to get the provisioning information? My answer to the first question – I have no idea! Perhaps Snom ran out of “options”? My goal is, however, to show you an alternative way to utilize this option and have central management solution in place. As many other well designed network devices, Snom endpoints will submit Option 60 (Vendor Class Identifier) in the in the DHCP Discovery broadcast. The goal is – if the DHCP server understands the option and the Scope/Server options are properly configured, the DHCP response will contain a very specific values meant for the requester (Snom) only. With other words, you could already have an Option 66 set for some purposes and still supply your Snom phones with unique value (namely “Provisioning URL”). Each Snom model submits the word “snom” (lower case!) and the model number in a single string i.e. snom300, snom320, snom360…snom870 and so on as “Vendor Class Identifier”. I got to think today - why not only “snom” so that we will have to configure the entire shebang one time only? Well, model 300 (with its simplicity), compared to 870 with the large color touch screen display, is like Ford Fiesta next to Cadillac Escalade. And… Snom 8xx series can show live stream (security camera for example) on the display… bottom line - different features require different provisioning options. 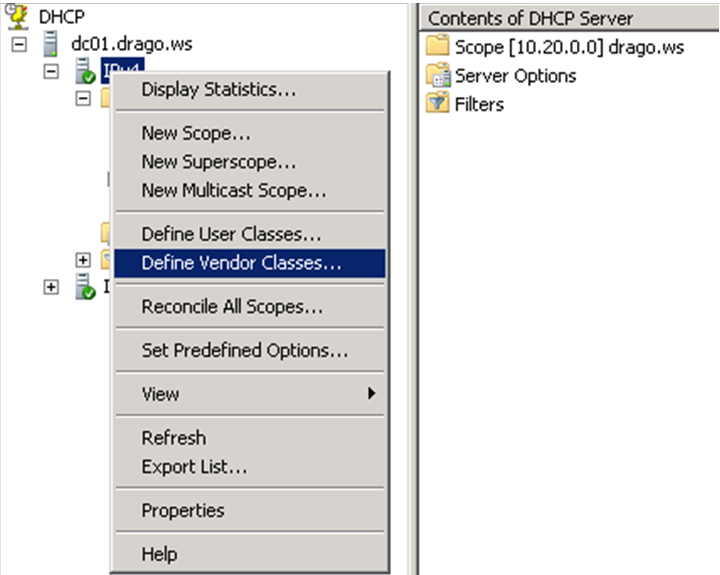 In DHCP Vendor Classes window, click Add button. In New Class window, populate as shown and click OK button. Repeat the above steps for each Snom model in your environment. ***by setting this prerequisites, we will send the provisioning URL via option 66, BUT encapsulated in Option 43 i.e. different way compared to DHCP Standard Option 66. Now right click over the Scope Options (of the scope your phones are on) and select “Configure Options”. Click “Advanced” tab in “Scope Options” window and select snomXXX from “Vendor Class” dropdown menu. …and enter the provisioning URL of your Provisioning/Settings Server. ***This part can be very tricky and need a little explanation. Notice that the box has three sections – Data, Binary, and ASCII. In the next post of this series I will explain how exactly Snom Provisioning works and what we can do with it. P.S. Have I mentioned that Snom300 works just fine with Wave14? Georgia Military College proudly announces successful implementation of the next generation of Microsoft’s communication and collaboration platform – code name “Wave 14” in Production environment! We are now moving users from OCS 2007 R2 to Wave 14 faster than the Congress approval rating is going down… which means – fast as we can!